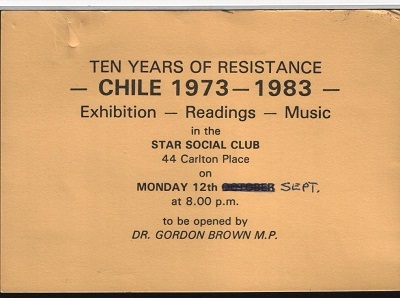 It is said that Gordon Brown was an active member of the student solidarity committee with Chile at the Edinburgh University. It is said that the student Campaign with Chile at the University was based in the office given to Brown as rector. How active was he in the Solidarity movement with Chile is something that I do not know. I do not think he came into contact with Chileans refugees in Edinburgh. (Perhaps I am mistaken here). 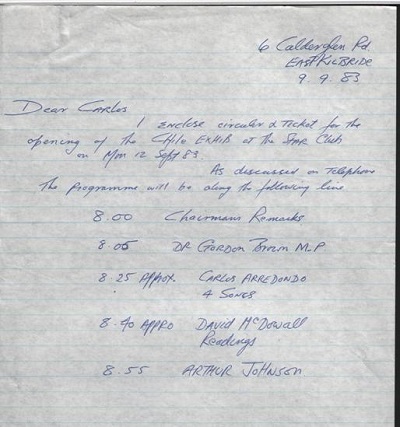 What I do know is that the future Labour Primer Minister in 1983 was a speaker in Glasgow to commemorate the 10th anniversary of the coup in Chile. I was invited to take part of that programme. It was part of an exhibition/readings/music programme at the Star Social Club. The great singer, always a friends of the Chilean Solidarity Campaign, Arthur Johnstone was involved too.